Hi everyone! Guess where I was this weekend...Home Depot. Not a big surprise though. However, I was in the garden section, which is really not my area and look what I found. 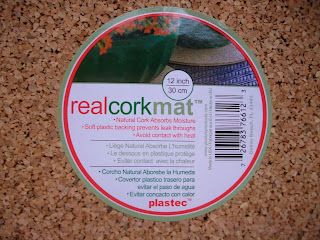 Those cork mats that you put under plants to absorb the moisture. Hmmm...looks like cute message boards to me. They come in assorted sizes and were a little pricey in Home Depot. These were $20.00 for all 5. Try Walmart...they were cheaper, but ours were out of some of the sizes. My largest is 12 inches down to the smallest of 4 inches and they have a hard plastic backing. 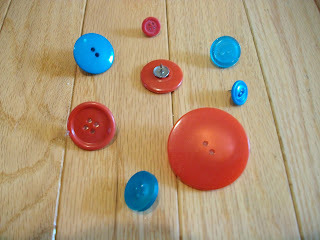 Just take your favorite old buttons, hot glue on a thumb tack and you're ready to go. I was thinking about using these in Courtney's new dorm room, so I only tacked them up temporarily on the wall above a desk until we go visit her again. I would use my favorite removable 3M sticky tabs to mount these. Wouldn't these look cute in a kitchen or above your sewing machine to hang notes or inspirations. You can even buy all of them in one size and line them up vertically in that hard to fill space in your kitchen, mud room or office. Have fun with them!! Very clever...and so cute! Also love your beach photos. The foot print pic is so sweet!!! I love it. 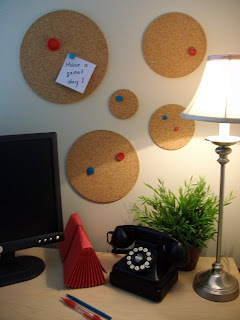 I actually have a corkboard for that same purpose, but those circles are much more original and decorative. Cheers. Ihave used the square ones and covered them with fabric and hot glue gunned buttons on tacks too! the girls had in their play room for years. You are helping me see Home Depot in a whole new light!! Thanks for another great idea! Oh boy, these are really cute! I could see them painted too to go with the decor of any room. You crazy girl, you've done it again. 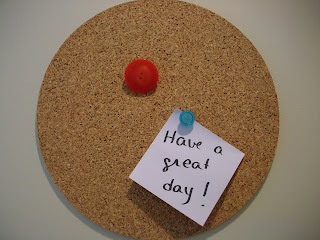 Great idea for temporary or permanent message boards! I like this idea, especially for the dorm room! Do these ideas just pop in your head while you are sleeping or strolling through home depot? What a cute idea! 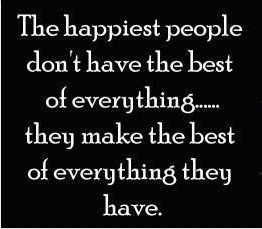 Thank you for sharing it. Hey Karen....Ikea also has these and if I remember correctly, at a pretty good price. Great idea. What a fantastic idea! I just love the thumbtack buttons. Love the pics of the footprint. I need those. I'm forever loosing my lists and notes. Brilliant! I think this is my favorite yet. That is such a cute idea! I might try something like it for my kitchen! 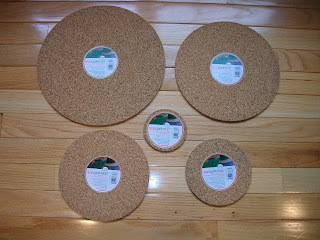 What a cute idea for these little cork circles. I like the idea for the button tacks too. Might have to give this a try. Karen--am loving this very cute project! Hope your daughter loves it, too! The office supply store and drug store are selling cork boards that are square, without frames. I bought a bunch. I am thinking of putting them all together side by side and making a big wall for my little quilts - doll quilts, ATCs and postcards, etc. I mod podged snowy black and white pictures of my parents-in-law's house and garden to the hard plastic part. Now they have coasters with photo's of home while they are living it up in Arizona for the winter. I like this idea! I buy my cork rounds from Ikea. They are sold in the kitchen section (and are great for trivets) and cost less than a dollar each. I also use them under all my plants to prevent water rings on furniture. I never thought of putting them up on the wall! Thanks for the inspiration! How about a small old wooden spool with a push pin (or magnet) on it to use in a sewing room! What fun! Great ideas here!